Not so long ago, Mercedes-Benz inked a deal with Renault-Nissan to share technologies and platforms. That sort of thing isn't unusual in the automotive world. But if I were Nissan, I would certainly be upset if a sportscar from the three-pointed star would wear the letters GT R. Agreed, there have been other cars in the past that have plonked those letters on their trunk, but it is the Godzilla that has made those letters holy in the automotive scriptures. To make matters worse, the Mercedes-AMG flagship doesn't draw a line at the name and has gone further to bag some bragging rights at the fabled Nordschleife of the Nurburgring - a circuit that is dear to the Nissan GT-R. While the Nissan was one of the fastest production cars around the 'ring, its namesake from Affalterbach is currently the fastest rearwheel-driven car around the Nurburgring's northern loop, clocking a lap time of 7:09.10. 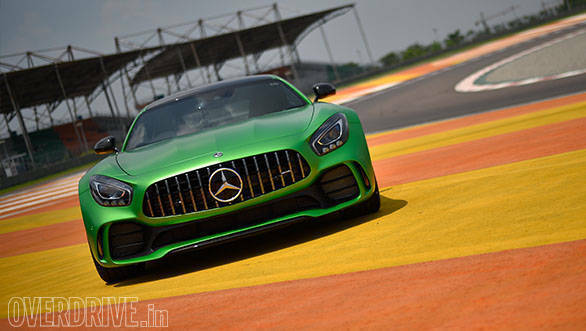 Those are some serious numbers and if that is not enough for us Indian audience that it aims to wow, the AMG GT R has even scorched the dusty tarmac at the Buddh International Circuit to set a production car lap record of 2:09.853. Mercedes-Benz invited us over to the BIC within weeks of that record run to sample the GT R. But with only one car at their disposal and 20 hacks rubbing their hands in excitement to have a go at it, we were repeatedly requested not to try or set another lap record. Since I had the chance of being one of the early runners, the tyres and the car were in great shape before someone actually beached the car into a gravel trap. It happened due to the driver's folly, but even at the hands of an experienced driver, it isn't hard to lose control of the GT R.
AMG's GT R is no restrained beast like Nissan's GT-R. It is evident even when she is standing still. There is a constant sense of motion to the design with its long bonnet and pulled back cabin, while the dagger like fins around the gills, the carbon-fibre skirts and splinters and the vertical slats on the grille add hints of ferocity. The 'Panamerican' grille gets its name and design inspiration from the 300 SL that took part in the Panamerican race in Mexico back in 1952 and it's astonishing how the grille alone is instrumental in making the lovely AMG GT S look pale in comparison to the GT R.
Both the cars share the same engine - a 4.0l bi-turbo V8. But the turbochargers in the GT R provide a boost pressure of 1.35 bar (versus the GT S' 1.2 bar) and that helps the motor churn out more power and torque. The engine is very sensitive about fuel quality and octane rating. Get it wrong and the GT R becomes grumpy. Get the fuel right and the engine will happily rev all the way to the redline. In doing so, it will produce up to 585PS and 700Nm, and all that torque is made available from under 2,000rpm all the way up to 5,000rpm. On the track, it means that power just keeps coming strongly and smoothly. GoPro footage tells me that on the back straight of the BIC, the GT R managed to hit speeds of over 280kmph before I could authoritatively drop the anchor with the optional ceramic brakes. 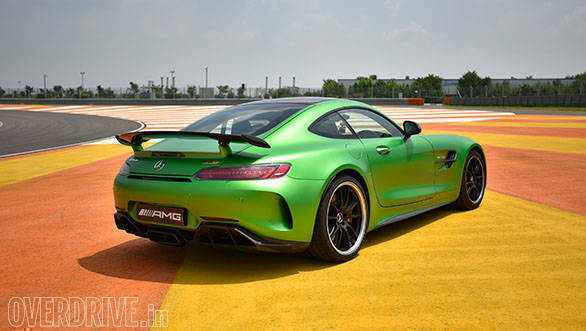 On a longer stretch of tarmac, the GT R should be able to hit 318kmph, says AMG. Naught to 100kmph takes 3.6s, which is quick but not alarming, considering performance sedans like the M5 have already broken that barrier. But the charm of the GT R is in the way it puts power down. 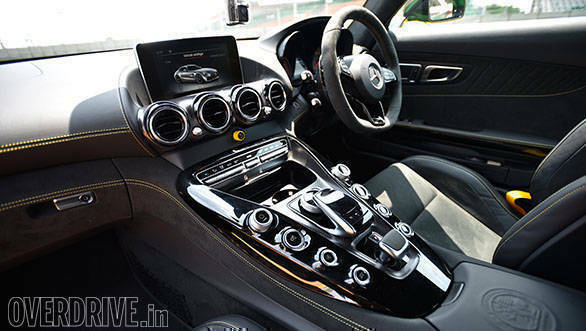 Helping that cause is AMG's favourite 7-speed dual-clutch transmission, which doesn't leave much room for complaint. The gearbox now also lets you launch the car at higher revs than the GT S for quicker race starts. But the party piece is the nine-step traction control adjustment which lets the driver fine-tune the level of slip on the rear axle with a knob on the centre console. In a nutshell, it will let you pull the smokey stuff through the corners and still manage to get a blisteringly fast exit. If it's a GT R, it has to rival a Porsche, and AMG's animal picks on the 911 GT3 - another monster raised in the Green Hell. Like the Porsche, this one too gets four-wheel steering for better agility despite the long wheelbase. While its benefit isn't evident at a fast-flowing track like the BIC, it will shine around tighter chicanes, switchbacks and parking spaces. The GT R doesn't have the grip or the dynamic precision of the 911 GT3, but offers quite an involving drive. 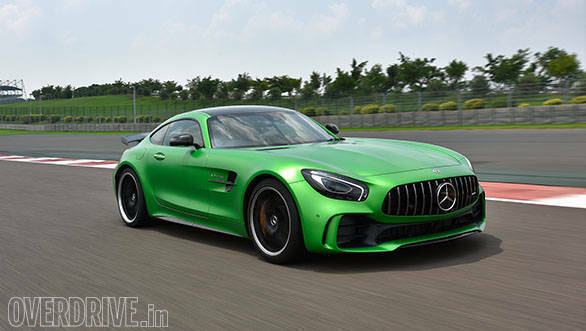 Both these cars are derived from GT3 racecars, and Mercedes-AMG would like you to see the GT R as a racecar for the road and not just a souped-up GT S. Unlike the 911 GT3, it doesn't get a roll-cage or racing buckets, but the GT R uses track-focussed equipment like coil-over suspension for better body control, uniball spherical bearings on the driven axle to reduce wear under track use, carbon-fibre torque tube and tunnel cross for weight savings and active aerodynamic components like the adjustable rear wing, self-adjusting front splitter and automated air-dam flaps which together provide higher downforce and better aerodynamic efficiency. Even the exhaust system has been engineered to produce a note evocative of AMG's GT3 racecar. It snarls with every breath even at crawling speeds and roars as you race for the redline. There are plenty of crackles and pops on the overrun, but hearing how angrily she breathes, you would also expect the GT R to spit and drool like a beast. Given my limited time at the track, I would reserve my opinion on how she will behave in the civilian environment, or how soft can she get in any driving mode lesser than Sport+. On the track though, the GT R seems to hug the road like a quick reptile. But with colossal amount of torque ready on tap and angry horses more than eager to respond to your throttle inputs, you need to have a measured control on your right foot. She isn't easy to go fast in, but the GT R can be highly rewarding once you understand how to tame her. Mercedes-Benz is bragging of lap records, and the last time I checked achieving those requires focussed lines and precise movement between corners. While the GT R can do all of that, it seems happier provoking its driver and clawing back at every chance it gets. In a sea of serious supercars, that is a welcome change. It adds more character to the performance and that is what I would rather have.